I am very happy to be the Guest Designer at Send a Smile 4 Kids challenge blog today! The theme for their challenge is "Fall or Holiday Wishes 4 Kids OR Anything Goes 4 Kids." I encourage you to check out their challenge, and enter a card made for a child. I created this card using Bugaboo Stamp's "Santa Clause Peeker." I also used Sketch #SC585 from Splitcoaststampers.com for my design. I began by opening Santa in Photoshop. I created a blank canvas, and moved him to that. I sized him to fit, flipped him horizontally, and printed the image onto a panel of 140 lb. watercolor paper. I actually made my paper a bit wider than in the sketch, since I knew I wanted to fussy cut him along the right edge. I colored the image with my Inktense pencils, using a damp paintbrush to pick up the color from the pencils and apply it to the paper. I find this method gives me maximum control, and keeps me from having pencil lines that won't dissolve when I brush water over them. I did add a bit to the bottom of Santa, just to make him look a little more like he had legs. I also colored his belt buckle & the frames of his glasses with a gold gel pen. After he had dried, I fussy cut along the right edge of the image. The other side of the sketch reminded me of a present. I cut 2 panels from The Paper Studio's "Christmas Basics" 6x6" patterned paper pad. I adhered them to a scrap of white cardstock, leaving about a 1/4" gap in between. In hindsight, I probably could have just cut one larger panel, & saved myself a bit of work. I wrapped a piece of white satin ribbon around the seam where I'd adhered them to the white cardstock. I wrapped another piece of ribbon around the center going vertically. Finally, I tied a bow from the leftover ribbon, and adhered it to the panel with a glue dot. I squirted a little liquid glue under the knot in the bow, just to keep it from coming untied. 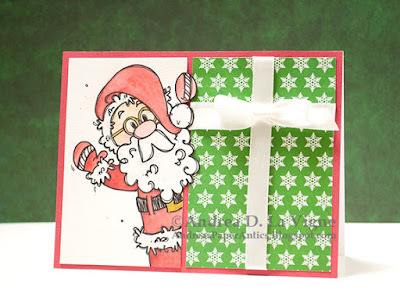 I adhered my Santa panel to a red A2 size piece of cardstock, leaving a 1/8" mat on the top, bottom, & left sides. I made sure not to glue down the parts that were sticking out on the right yet, though. Then I adhered my "gift box," tucking the left edge under Santa's hand & beard. Finally, I glued the rest of Santa to the card, and adhered the card front to a white card base.